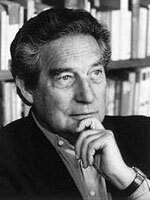 Octavio Paz (1914-1988) was born and raised in Mixcoac, a present-day part of Mexico City. His family supported Emiliano Zapata, and after his assassination, were forced into exile in the United States. Paz was only nineteen years of age when he published his first collection of poetry, entitled Luna Silvestre (Wild Moon). Throughout his career, Paz founded two literary journals, Barandal (1932) and Taller (1938). In 1945 he began working as a diplomat for the Mexican government, and traveled to such places as Paris, Tokyo, Geneva, and Mumbai. His travels influenced much of his work, and he published many of his books while working abroad. In his remarks about the poet, nominating author Manuel Durán said of Paz's work, "By approaching language through poetry and passion he deals with a universal fact—there is no culture without language, and language belongs to all of us—through feelings (sensuousness, sexual passion) that are also our common heritage," ("Octavio Paz: The Poet as Philosopher," WLT Vol. 56, Autumn 1982). Paz's many collections of poetry include the titles Entre la piedra y la flor (1941), Piedra de sol (1957; tr. Sun Stone, 1991), and Renga (1972). Additionally, Paz wrote many essays, shorty stories, and plays, including El laberinto de la soledad (1950; tr. The Labyrinth of Solitude, 1961), Corriente alterna (1967; tr. Alternating Current, 1973), and La hija de Rappaccini (1956). In addition to his Neustadt Prize in 1982, Paz was awarded the Nobel Prize in Literature in 1990.